This week the Horror Duo end the year strong with one final pair of family oriented yet very bleak films featuring stories who's characters inevitably question their faith. 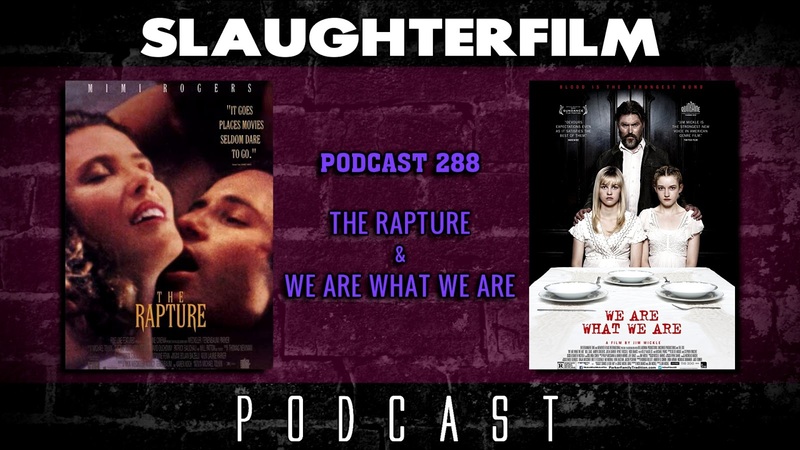 Forest shares his thoughts on the little talked about film The Rapture. Cory recommends a re-make that is actually worth checking out, and that is the very cannibal We Are What We Are. Forest also discusses his disappointment with Star Wars: The Last Jedi, Cory raves over The Belko Experiment, and both riff over the recent news that the United States Government funded a UFO investigation for nearly a decade in the 2000s. All this and Forest & Cory open up a little about their beliefs and their take on God. CORRECTION: Cory mentions a connection between Nevada representative Harry Reid and Roswell (New Mexico). He meant to say Harry Reid and Area 51 - which is located in Nevada. For more Slaughter Film news and reviews, as well as show notes and special events, make sure to visit our website; SlaughterFilm.com. 39:00 - "We Are What We Are"